The parking options available to the public are street parking or ramp parking. Street parking on Phillips Ave - free parking after 5:00 PM The closest ramp is located directly east of Crawfords's on Mall Avenue (one block east of Phillips Avenue) between 11th and 12th - free parking after 6:00 PM and on weekends. Sioux Falls Area Transit(SAM) stop located directly east, behind Crawford's. Live music every Sunday evening. Upper level can be rented out for private dining. Situated in beautiful historic downtown Sioux Falls: surround yourself with century old quartzite and brick walls, funky & energetic ambiance, tempting & flavorful dishes, innovative cocktails and an extensive wine & beer list. Take notice of our namesake as you are stepping over the threshold, the original 1963 Crawford's logo is still there. The decor unabashedly integrates masculine and feminine: wild west meets gypsy...from the cowhide paneled bar, quartzite bar top, iron railroad track footrest and reclaimed wood tables to the vintage tiles, jeweled wallpaper, Moroccan chandeliers and antique Indian columns ...no detail is left untouched. The same holds true for the food: from your prime cut of steak to the wild-caught salmon, every element is carefully considered. Excellent lunch & dinner menus, full bar, 58" plasma tv's and fireplace. fried calamari strips with lemon, herbs and spicy aioli. handmade with signature herbs and spices, served with sundried tomato remoulade. 6oz angus beef tips sautéed and glazed with bourbon. served with garlic fries. spinach, artichokes, smoked gouda and sundried tomatoes. served with garlic crostini. aged brie, fromage blanc with strawberry compote, gorgonzola, smoked gouda, fresh mascarpone and garlic crostini. shiitake, crimini and button mushrooms, havarti, roasted garlic and black truffle oil. sundried tomato marinara, housemade sausage, salami, green olives, roasted peppers and fresh basil. finished with pine nuts. grilled chicken, roasted peppers, red onion, spinach, olives, tomato and feta and boursin. grilled filet dusted in cajun spices served with spring greens, red peppers, banana peppers, onions, cucumbers, cherry tomatoes and feta cheese. finished with devil's vinaigrette. crispy chicken breast served over spinach with grape tomatoes, red onion, roasted peppers, cucumbers, spicy walnuts and bleu cheese dressing. salmon fillet grilled medium-rare set atop artisan greens, roasted apples and strawberries, tomatoes, red onion, toasted almonds and fromage blanc. finished with maple vinaigrette. grilled chicken breast on a bed of romaine with fresh-cut croutons, parmesan and caesar dressing. 14oz hand-cut ribeye served with roasted mushroom risotto, grilled asparagus and finished with white truffle butter. one filet crusted in peppercorn and finished with cognac cream demi glaze and one filet grilled and topped with roasted shallot butter. served with garlic mashed potatoes and grilled asparagus. kansas city strip loin served with garlic mashed potatoes. topped with mussels, clams and shrimp tossed with fire-roasted peppers, red onion and green olives. finished with gorgonzola cream sauce. 32oz minimum cut bone-in ribeye with crawford's demi-glace. served with two sides. this beauty can take up to 45 minutes to prepare depending upon your cooking preference! 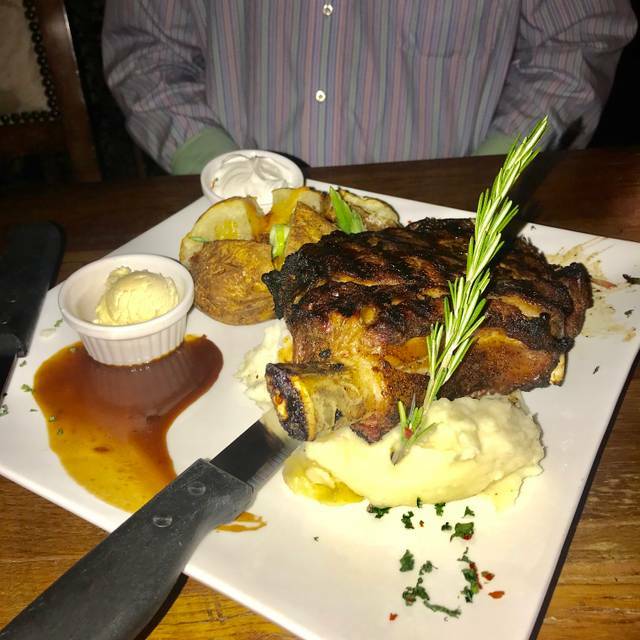 10oz cut of slow-roasted prime rib studded with garlic and rosemary and finished with au jus and horseradish. served with two sides. maple-glazed fresh salmon, broiled and served atop cranberry walnut wild rice pilaf and accompanied with seasonal vegetables. beer-battered walleye served with garlic mashed potatoes and grilled asparagus. finished with a sundried tomato remoulade. mussels, prawns and clams tossed with roasted tomato, red onion and roasted peppers in garlic cream. finished with fresh herbs, feta cheese and pine nuts. .
grilled pork chop set atop garlic mashed potatoes topped with rosemary and apple chutney. apricot glazed pork shanks served over mashed sweet potatoes with grilled asparagus. bacon crusted chicken breast served with grilled asparagus and mashed sweet potatoes. finished with gorgonzola cream sauce. garlic marinated chicken sautéed with crispy bacon and english peas. tossed with fettuccine noodles and finished with a rich cream sauce. Steaks, burgers and prime rib all over cooked. Sides did not come as ordered. Dessert was good. Very good food and our service was excellent. Between the four of us we had salmon, walleye, and soup/salad and flatbread - All were excellent with the only thing to note was the salmon was a bit dry. The grilled asparagus was huge but still tender, steak fries were the best we’ve ever had (normally I wouldn’t mention fries, but they were that good!). We didn’t do a lot of research before coming in so we weren’t expecting this nice of a place, being labeled as a ‘bar and grill.’ All in all it was a good experience. There was an acoustic guitarist there that played a nice variety of good music. Perfect for the evening, he had a great voice too. Thank you for accommodating me and my loved ones for my birthday dinner! You made me feel special and treated us well ! Great food and the service was just as great. Kim was our server. I do think the music was a bit loud though. We definitely will return and recommend. 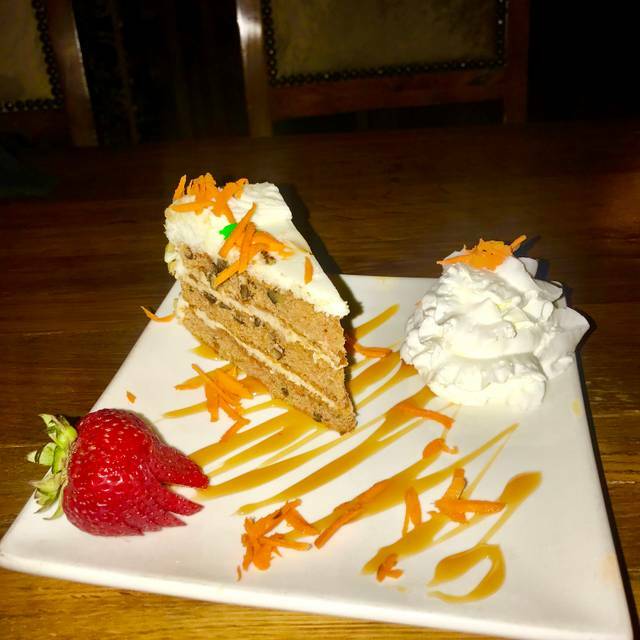 Great food and impeccable service! Our waitress was amazing and helped us make awesome decisions and explained the menu well! Amazing food! We will definitely be back! Entree's were very good, nice menu, prices were reasonable- service was excellent, waitress was very engaging and fun! Really appreciated her making us feel so special - Thank You! Friendly staff and good service. It was St. Patty's day so pretty noisy which was understandable. Enjoyed our night and would definitely go back again. We’ll be back! Our first visit was a busy-ish night - drinks took a long time getting from bar to table, and our appetizer never did show. The server was very professional about it and did the best she could. The great food and good vibes were enough to cover for the behind-the-scenes mishaps. Love the atmosphere and food. I would definitely recommend it to friends. Fabulous!! Great atmosphere. Eclectic and laid back. Awesome staff. Highly recommend. We love everything about Crawfords!! The atmosphere is amazing and the food is delicious. Also love just hanging out eating Smores and having the lavender lemon drop martini! We will he back and will bring friends.. Wonderful atmosphere and amazing service they always checked up on us and we never had to ask for anything!! 4 of us gathered for an evening out. We each had an excellent meal prepared to perfection! Service was excellent! If you really want to get your taste buds dancing, you must try the Epiphany martini....it is quite the experience! Great atmosphere, great service, excellent food. Love this place! This is a cozy urban chic kind of place. Very special. Great for foodies. Love the decor too. Everything was amazing except we were there for 2 hours. Waitress was polite and sweet but didn’t come back very often. Way to much time wasted between drink order, app, meal etc. Outstanding environment with great excellent service. Couldn’t have gone any better. Will come back again when I am in town. Perfect atmosphere for the occasion. The service was great, but the food was mediocre. I had a steak salad and it was not great. Watery dressing, small steak portion and lettuce that did not seem crisp and fresh. The cider beers were tasty. The food was absolutely delicious. My husband had prime rib, and I had the apricot glazed pork shanks. The special dessert strawberry peach cobbler was scrumptious. The waitress was helpful, very personable, and efficient. Great first visit from out of town. We will return. Food was excellent. It was a little noisy once the restaurant started filling up but not terrible. Service excellent. We were from out of town and thought the prices a little high. Ambiance, service, drinks and appetizers are great! The actual meal, not so much. No one was happy fully with their food. We all agree that appetizers and drinks are great and will continue to come back for more. Great venue for great food and drinks. Food is high quality, so do not expect pub grub, or to pay for pub grub. The atmosphere is cozy and the staff is great. Went out with another couple for NYE and really enjoyed ourselves! Good food, neat ambiance but poor service for the price! 3 of the 4 meals were great, tbone was poor, tough and over cooked and cheep looking. The rest of the meal was wonderful. My sweetheart treated me to a wonderful birthday dinner here, the first time either of us had been to Crawford's. I had steak, a juicy filet that was tender and tasty. My companion enjoyed the salmon salad. The service was excellent and we both loved the ambiance. We love the atmosphere but our meal was so-so. We were having our office Christmas party. We had drinks, appetizers, soup, salad, entrees and dessert. The drinks and dessert were the best part. A gem in downtown Sioux Falls. Big city feel with a downtown atmosphere. Outstanding service..the food was good as usual, but the menu hasn't changed in a very long time. Thankfully there was a specials menu with a couple of options.....note to Crawfords.....PLEASE revamp your menu offerings! The food, place and service was all top notch. We thoroughly enjoyed ourselves and will be back! Food and drinks were delicious. Some of the best service we've had in Sioux Falls. Mackenzie was delightful! I took my husband here for his birthday. We were warmly greeted and offered a quiet spot for our special evening. We will be back!